SPX pulled in a little over 5% and bounced off support levels. This small correction has setup a lot of good looking charts going into this week and the McClellan is still working off extreme oversold levels. I have a couple long setups on my radar if we continue with this bounce. CF – Last week I started selling bull put spreads in CF. Watching for more volume to come in and break price action out of this shorter term basing pattern and over volume resistance. 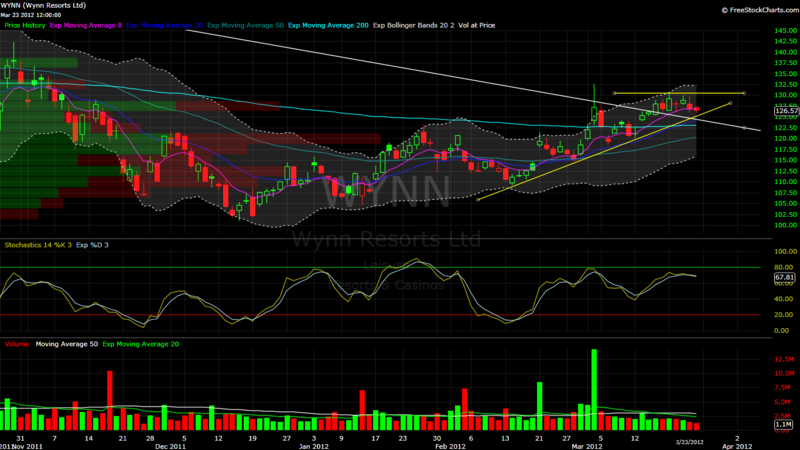 WYNN – Price came back in and tested recent support levels and the 50ema. Friday’s close was back over the 8 & 21ema. V – Bull flagging under some pretty heavy volume resistance. 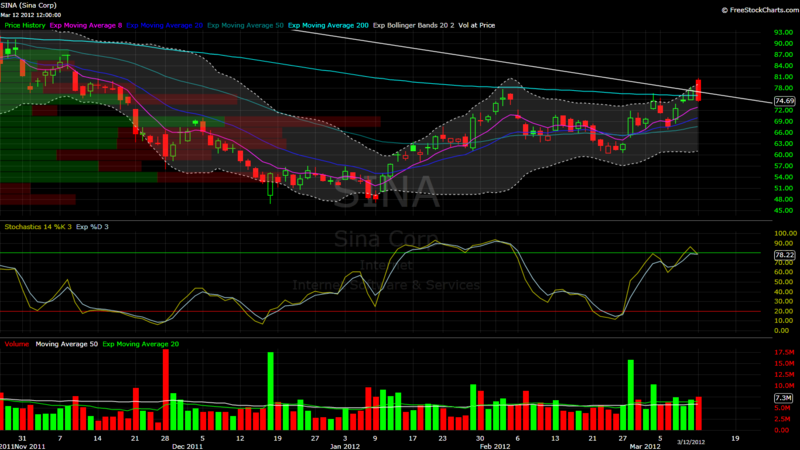 Watching for significant buying volume to bring price higher. Would like to see at least 5m shares. GMCR – Sold out of my core position on Friday and just left with the trailer via JUL 80s. I still like the chart going into next week so I might roll them into the JUL 85 calls. After clearing resistance at $76.50 my next target is $81.00. CMG – Worked off overbought levels quickly. 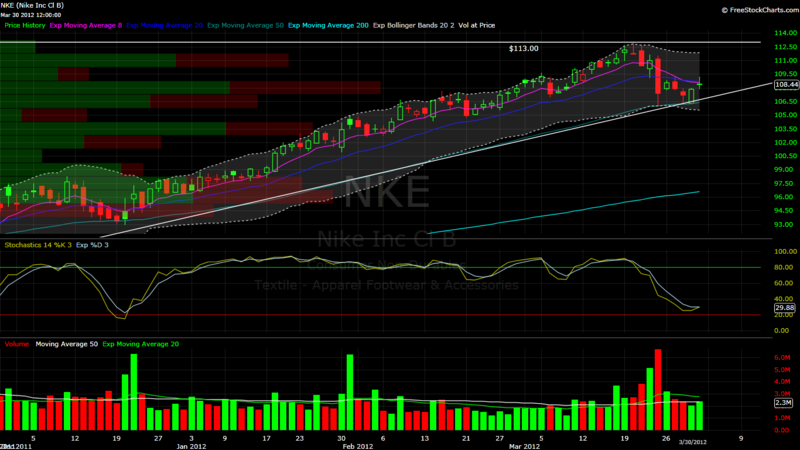 Tested volume support, the ascending trend line and the 50ema on the daily. Closed strong on Friday near the highs and with above average volume. First target is volume resistance. GOOG – Bounced off the 50ema last week and had a strong close on Friday on above average volume. Cleared this short term descending trend line and looks ready for a rotation higher. First target is $890s. ORLY – Digested action through time rather than price and tested the previous breakout level. Cleared short term descending trend line. Looks ready to make new highs. SSYS – Weekly – Double top and lost the 10ema on above average volume. Next major support is $68s. NEM – Long term series of lower highs/lows. Price is overbought again and if pattern continues it will rotate lower. Recent lows now acting as support. Max pain could be a close over the yellow descending trend line — roughly 37s. SPY – Last weekly candle tested and rejected the long term upper trend line from the 2009 channel. 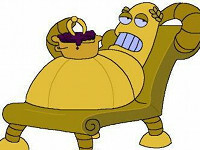 I am expecting a short digestion pattern to take place over the next week or two. DXY0 – US Dollar index – Possible double top pattern on the daily chart. Closed below the 8ema on the daily and could retrace a bit. Open gap to close at 83.46. DISCA – Consolidation pattern on the upper range of the descending channel. Volume support just above. Watch for volume to push the price over resistance. SJM – Overbought levels were worked off through time rather than price. Volume support was tested and held. First target is the upper trend line of the descending channel then recent highs. ROST – Consolidating under volume resistance. Would like to see price clear higher on >2.5m shares. 20ema on the daily held. CNK – Tested the longer term ascending trend line and volume support last week. Looks good for higher prices. Stochastics and relative strength turning up. Considering selling JUN 30 puts if I can get a good price. Volume on the chain is a bit low. AMGN – Watching the descending trend line. 50ema on the daily held up and a small volume support shelf. KMB – Major volume traded during the last two sessions and bullish price action. Tested a longer term ascending trend line and smaller descending channel. First target is volume resistance level, roughly $105.50. SPX – Weekly chart. This is the rising channel from the 2009 lows. There is still room for upside. The top trend line is ~1690-1700. Even after Friday’s impressive run the McClellan Oscillator was unable to achieve overbought levels (>50). The dollar’s strength has been incredible & I don’t see any reason why it won’t test the long term descending trend line starting from 2004. Meanwhile, the market is completely ignoring this action. 30 Year Bonds – Weekly – Building a head & shoulders pattern with some volume pockets significantly lower. The daily chart shows a fib retrace at roughly 146’18 right near the confluence of moving averages & impeding bear cross. AMZN – Watching the descending trend line — a push over it with above average volume could trigger a higher high and eventually a test of recent highs. AMT – Three weeks worth of consolidation after a 15% run higher. Buy trigger for the next leg higher is $85.25 with preferably 2.5m+ shares. AAPL – Volume signature is a bit concerning but I can’t help but notice the inverted head & shoulders pattern. I am long via a very small position of bull call spreads. I will close them for a small loss if we lose $419.00. BIDU – Looks like the last few months have been a basing pattern with a few hints of accumulation. Price & volume will need to confirm the move but I believe last weeks action will confirm to be a bull flag. Watching. CMI – Watching for a break over the descending trend line and volume resistance to start the next leg higher. Volume signature looks good. The XLE has been hot & the rotation into these names has already started. I am expecting to see more upside in a lot of these names this week. I wouldn’t recommend loading up with the entire lot but these are the best looking charts in sector — focus on one or two of your favorites. APA – Cleared this long term trend line on heavy volume and recaptured the 200ema. Wouldn’t be surprised to see a little more digestion but it looks ready for long term higher prices. COG – My favorite play for this week. Friday cleared and closed over volume resistance on above average volume. Recent highs is the first target then I would expect a breakout of the ascending triangle. MPC – Cleared the descending trend line on Friday and closed right at volume resistance. Look for higher prices if the volume continues. XOM – Looks ready to come out of the long term base. $93.60 is the first target but I think $100 is a realistic target before the end of June. APC – Friday started a break out of a mini cup & handle pattern inside of the longer term ascending channel. First target is the upper trend line. EXPE – Possible bear flag developed off the EPS drop. A close below the 200ema would trigger the short entry with a first target of the recent lows. PRE – Lost the rising trend line and major volume support on heavy volume. Stop on a short entry would be a close above the volume support level (about $91.25). CHTR – Daily – Bullish stochastic divergence. 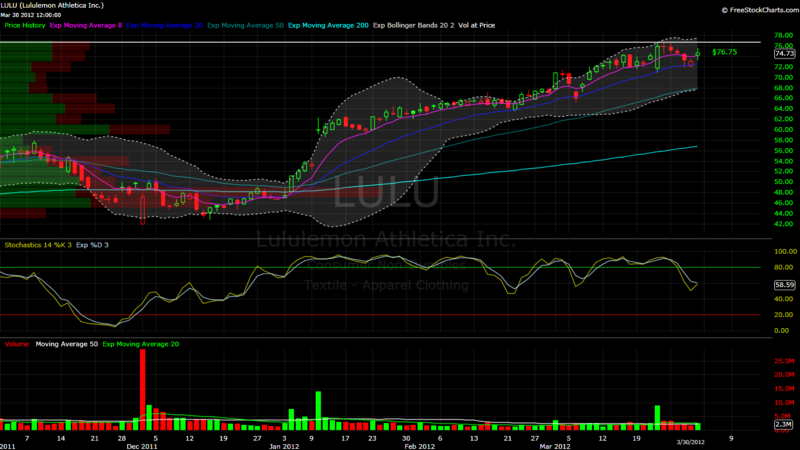 Nice looking bull flag & digestion pattern on lighter volume. CHTR – Weekly – Bull flag on lighter volume, the chart rested and let the 10ema catch up. FLS – Testing the descending trend line & noticing signs of accumulation. I am watching for a break higher on continued increasing volume and a test of the highs. EBAY – Bounced higher last Thursday & Friday after consolidating on the long term ascending trend line. First target is the gap fill at $55.65. MNST – Consolidating under resistance levels. Bullish stochastic divergence on the daily chart. Golden cross should happen this week. SCHW – Cheap name. Cleared resistance levels with increasing volume. Next level is $17.85ish. COP – After running almost 10% in two weeks I would expect to see the price come in a bit before continuing over the next resistance levels. DVN – Testing the long term descending trend line after closing green 10 days in a row. Looking for a small retrace back into the moving averages. Trade will likely be a day trade unless the market shows some significant weakness. GS – Tested and rejected the top of the descending channel. $147.30 is a long term support/resistance level. AVB – Looks like a great short opportunity should we see any roll over in the markets. If the price begins to rotate lower the first target is $125.50. About an equal number of long setups vs short setups this week. As much as I believe the market is in a topping pattern, I can’t ignore the good looking long setups. Cautious outlook moving forward. Cut your losers fast, scale out of your winners and raise stops to protect your profits. Not all of these setups will trigger this week. Anticipate price action but always wait for confirmation. FLS – Tested the long term rising trend line last week and bounced off volume support. I am looking for a test of the descending trend line this week. MA – Price action is coiled up inside of this pennant. Watch for an increase in volume to break higher. AFL – Weekly chart – Testing volume resistance and the top trend line of the descending channel. Price worked off overbought levels inside the ascending triangle pattern. CNK – Watch for an increase in volume to confirm a break out of the ascending triangle. First resistance is $29.50. UPS – Building a base under resistance. Volume signature is expanding. Watching for the breakout this week. 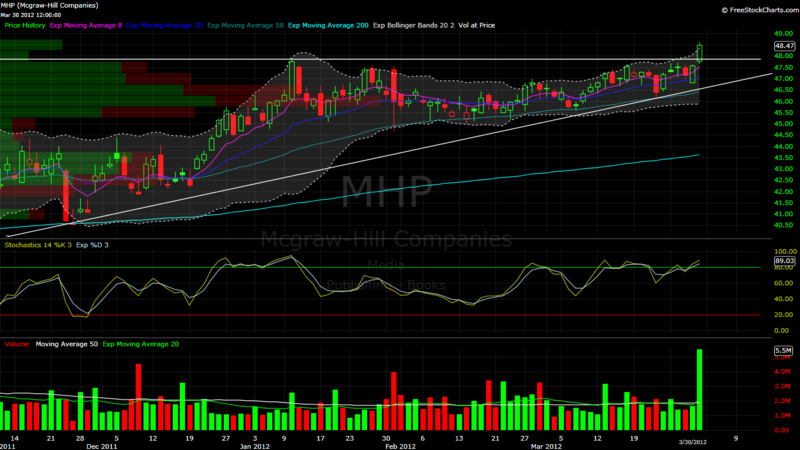 PHM – Longer term ascending triangle and testing volume resistance. 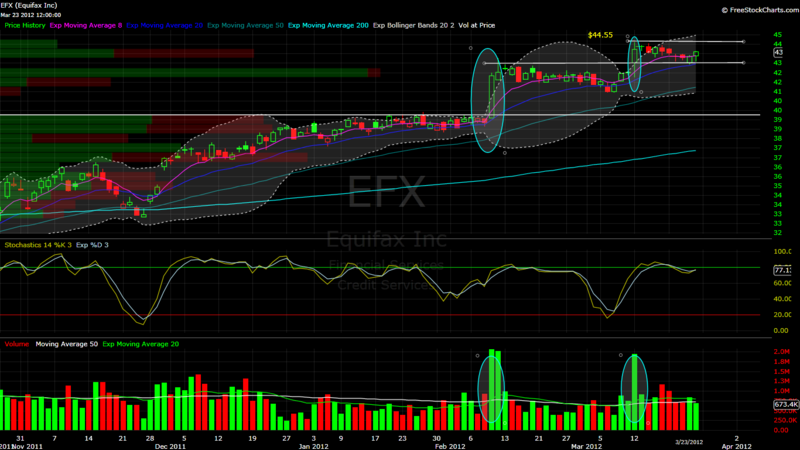 Could use a pull back or sideways consolidation before the breakout, but won’t be necessary if the volume comes in. COP – Another ascending trend line tested last week and volume expansion. Recaptured the moving averages. EMN – Tested and rejected the top of the channel. Lost the major moving averages on Friday. Looking for a test of the lower trend line. AXLL – Head & shoulders pattern. Volume support and neckline share the price level. Earnings coming up this week. AVB – Tested and rejected the top of the channel & lost the moving averages. Stochastics worked off overbought levels quickly. DVN – Weekly chart – Long term descending triangle. Would like to see a bounce to be able to start a short position off a test of the descending trend line. MUR – Bear flag. 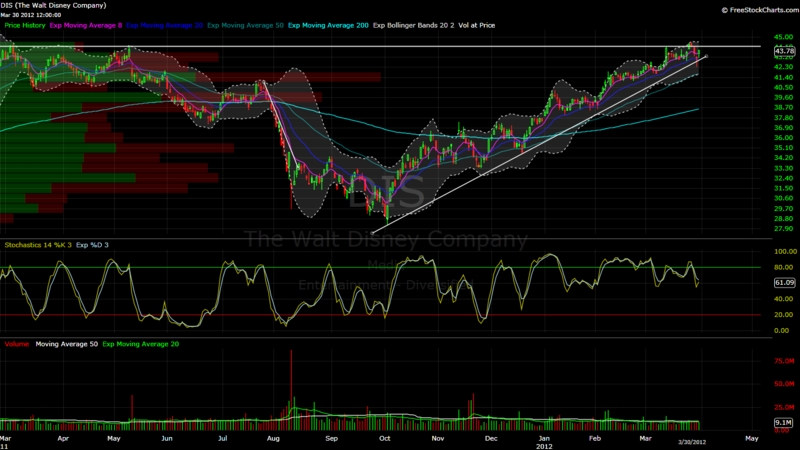 Consolidating on lighter volume with a measured move to $56.50ish. EBAY – Another bear flag setup but EBAY has been strong stock will need increased selling volume to lose the rising trend line. Don’t forget to double check your earnings dates. 30 year treasuries are building a base inside of an ascending triangle on the 60 minute chart. Breakout or failure of this pattern will be critical to the direction the market takes this week. I am expecting further upside to the bond markets so my book is positioned net short going into Monday. This is another big earnings week, be sure to double and triple check your positions. CAM – Last Thursday many areas of support were tested and held. 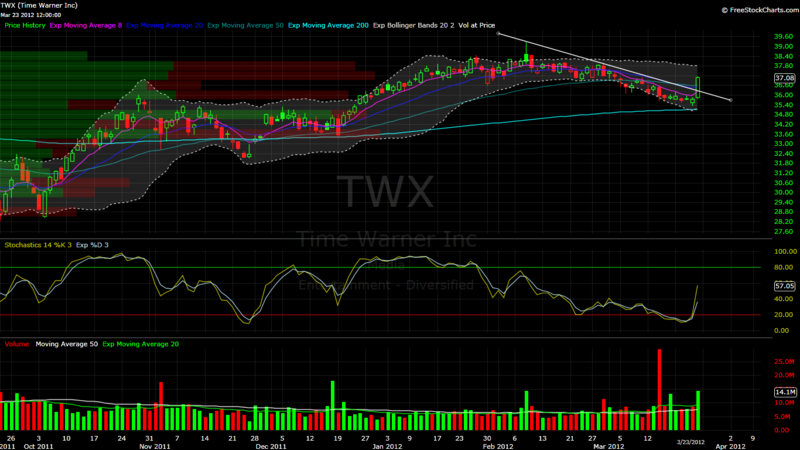 I am watching for a volume expansion and a follow through to the first target, 50ema on the daily. ADS – Building a base since mid January and putting in a series of higher lows. Late last week volume has started returning into the stock and it could be ready to print new 52 week highs. 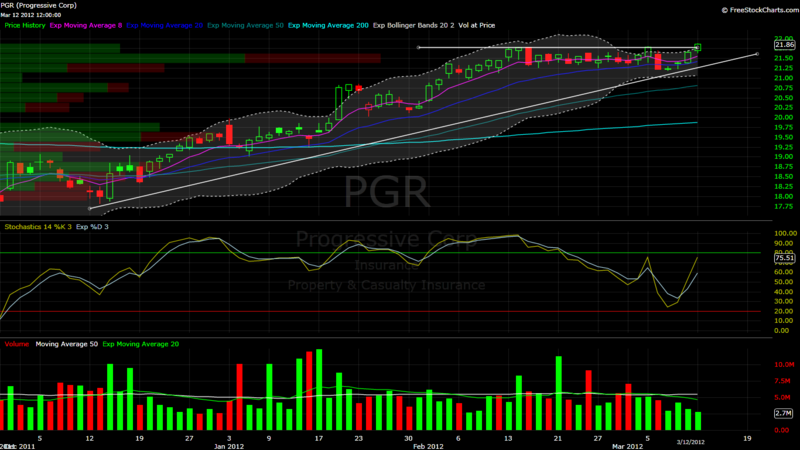 PPG – Testing the top descending trend line of this channel. Volume starting to come back in and I am watching for the breakout. DE – Testing the ascending trend line, descending trend line & volume support. Similar chart to CAM. Risk/reward heavily in our favor with stops below last weeks lows. GS – Another low risk/reward setup with stops below last weeks lows. First target is the 8ema on the daily chart. Once your first target is achieved you should scale out of your position and raise your stops to protect your profits & allow your winners to run. DECK – Consolidating over volume resistance this past week. 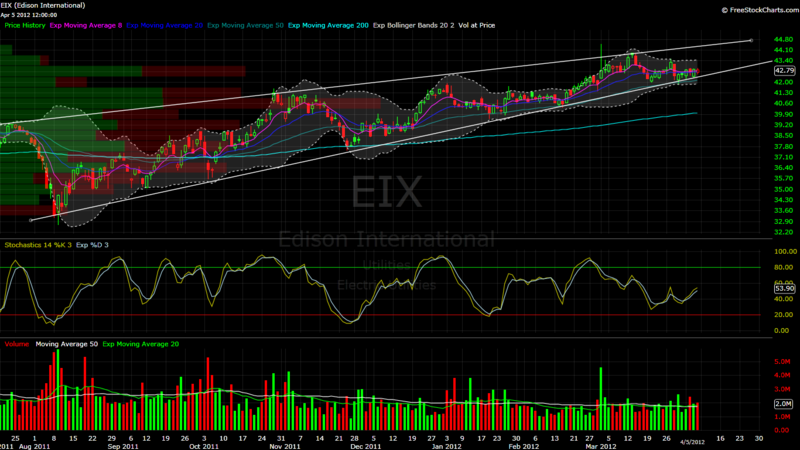 Wanted to see signs of accumulation to clear the price higher but we won’t likely see it until after EPS. 35% short could be explosive to the price if the company surprises. I will trade the reaction to the report if the price action is favorable. TRIP – Looks to be building a topping pattern. Watching for a channel failure and breakdown below the 50ema on the daily. TRIP is not reporting this week but EXPE reports on 4.25.13 and there will likely be pin action. WLL – Weekly – I am watching this longer term pennant formation. Volume and stochastics are suggesting a breakdown. First target is $40ish then 37.00. BIDU – Couldn’t keep enough buyers in the stock to support higher prices. It printed a lower high and is building a descending triangle. First target is recent lows. I scanned 3,000 stocks this weekend and for the first time this year the bearish setups outweighed the bullish. 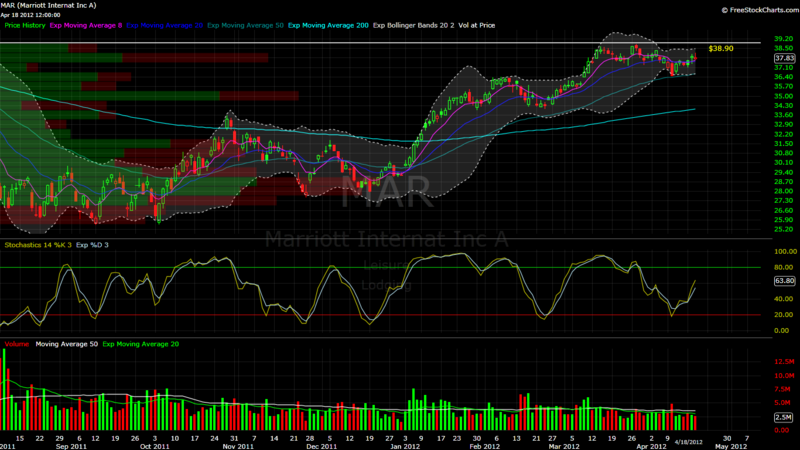 Didn’t find a lot of good looking patterns, but I have a bullish bias for end of quarter mark up. V – Still range bound in this descending channel. Volume starting to come into the name again. The top of the channel is also some pretty heavy volume resistance. This is one of my favorite bullish setups going into next week but it may need another week or so to trigger. I’ll be watching. 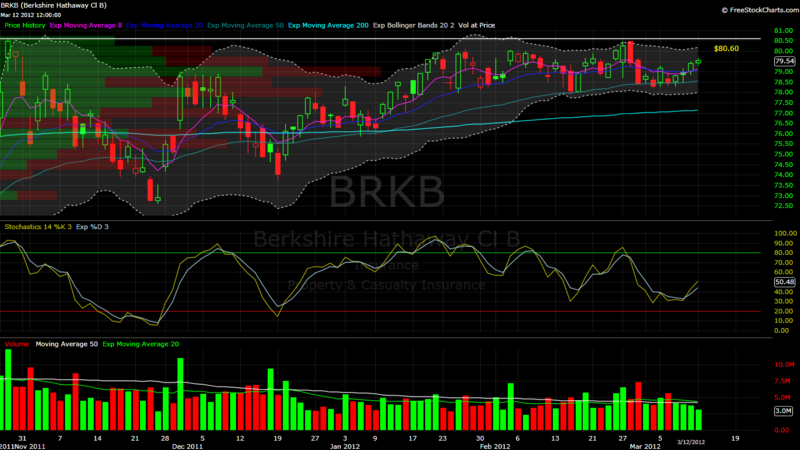 TK – Friday’s action tested the top of the pennant. Watch for volume to step in and bring higher prices. First target is the volume resistance just shy of $36. Be aware the shipping sector may be ready for a pullback. HD – A series of higher highs and higher lows is healthy bullish action and should bring a test of at least the recent highs. 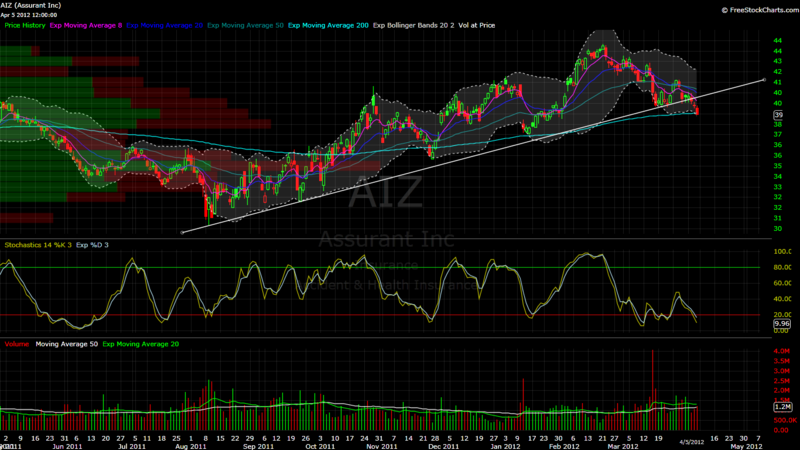 ADS – Maintained this rising trend line and bounced off the 50ema. Closed back over volume resistance on Friday. Stochastics and RSI turning back up. CSTR – Bull flag on the daily. 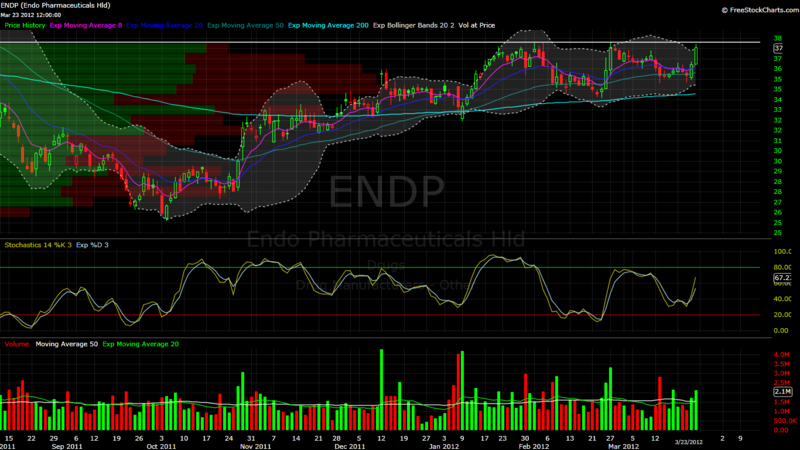 Trading over volume support and has a gap to close at $59.00. Could be a nice candidate for bull put spreads. VMC – Watching for a long or short position off this rising trend line. 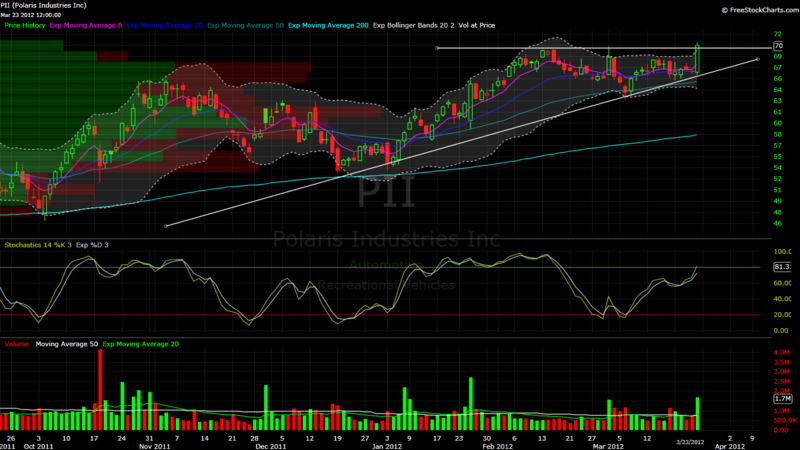 Price action may find support and bounce but the head & shoulders is standing out to me. Closed pretty close to the lows on Friday — not a pretty candle. EMN – Increasing selling volume at the end of last week and a failure of the 50ema on the daily should bring price down to the next support level (the rising trend line). FCX – Descending triangle pattern. Stochastics overbought. Looks like it wants to test recent lows. Stop would be a close over the descending trend line. HAL – Failed the ascending trend line last week on heavy selling volume. Sideways consolidation and a measured move from the bear flag brings a test of the 200ema. DJIA – Weekly chart. Broke out over previous highs of 14,198.10 and I am looking for higher prices before we correct. In my opinion, the SPX will see all time highs before the correction — However, it wouldn’t be unusual to see this market digest through time first. Still too man pundits in the media calling the top. The market is punishing them. Money has been flowing out of the bonds for the better part of 2013. The TLT (weekly) is looking for an obvious test of the 200ema, if this current price fails. TLT got beat up pretty bad last week, a dead cat bounce is welcome and I’ll initiate a new short position. I am interested in selling TBT puts. EBAY – Above average volume day on Friday. Nice hammer developed off this rising trend line. I started a 1/4 size position in APR $55 calls. Looking to add. Failure of the trend line is my stop. 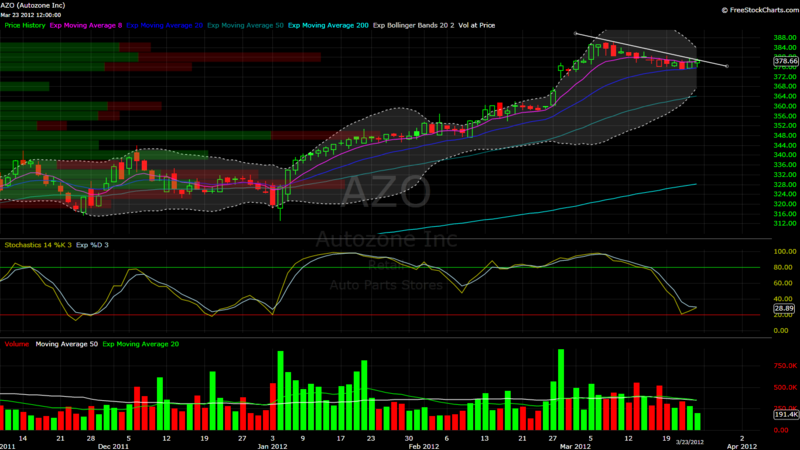 AZO – Back on the list this week. I’ve been stalking this channel for months, if this turns out to be the bull flag to break us higher I am going long via APR calls. It will need room to work, that needs to be factored in your risk management plan. AMZN – Nice looking bull flag on lighter volume this past week. MA – Consolidating just over volume support of $525. Watching a test of the 8ema on the daily or a push over this descending trend line with volume to start a new long position for the next leg higher. HAL – Looks ready for higher prices. Got back to oversold levels quickly on that last pull back. Following this ascending trend line out of this long term base. BAX – Cleared this ascending triangle pattern and is consolidating above volume resistance. Setting up for a move higher. NFLX – 60m chart – Consolidating under this descending trend line. Watching volume for a push higher. 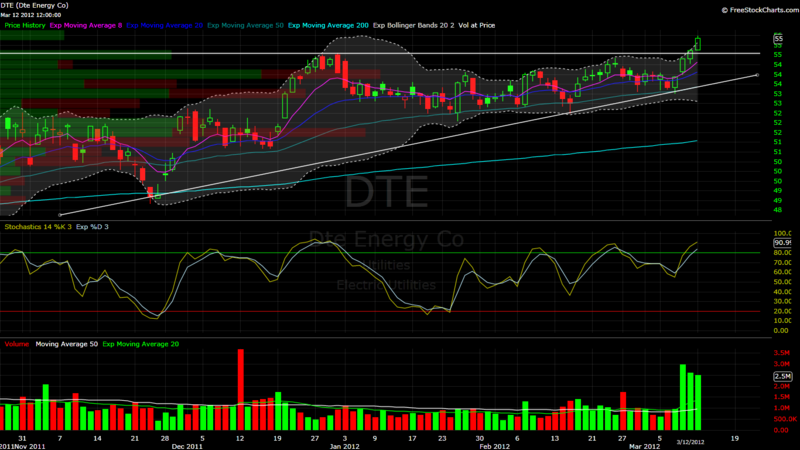 Daily chart has been working off overbought levels nicely while maintaining price. HLIT – Watch for volume and a break over 5.85 to clear this long term base. RNDY – Consolidating under volume resistance. Textbook volume signature on the bull flag. This is what you want to see. FB – Humans are pattern seeking creatures, without even trying we try to connect the dots to everything we see and hear. This can work heavily in our favor but against us too. This chart is a head and shoulders pattern and a cup and handle at the same time. I started a short position on Friday at $27.85 without noticing the cup and handle in the same chart. I am giving it a $1 stop and may bail earlier if I feel like I am wrong. TLT – Bonds got beat up last week so I am looking for a dead cat bounce to get into a short position via selling puts in the TBT to take advantage of this descending triangle. 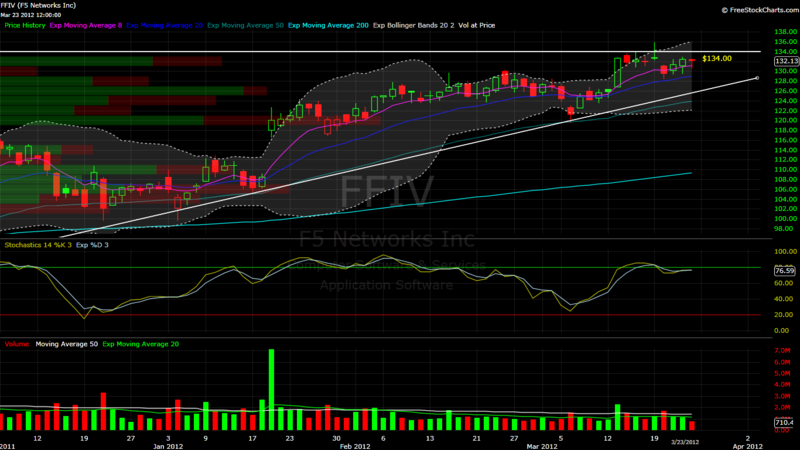 FFIV – Bear flag on the daily. Sideways consolidation, Friday’s action couldn’t maintain the 8ema on the daily and selling volume is beginning to increase. Looking for a test of at least the lower volume support level on the chart. 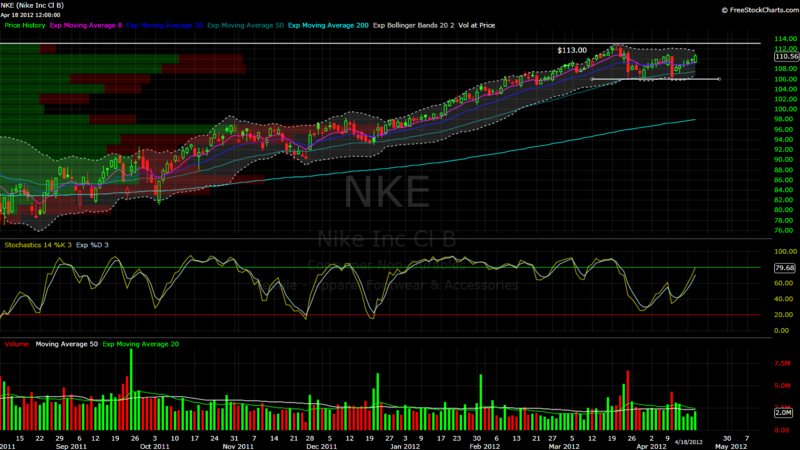 NKE – Watching the selling volume near the volume support level and ascending trend line. Could be a low risk/reward short opportunity. Open gap below at $49.53. SPX – I know that the inverted head & shoulders pattern is typically a bottoming pattern, but this is standing out to me. It would seem there are still too many top pickers for the market to roll over here. Weekly bias is bullish for me. Thinking we see a minimum of 1527 on the ES_F. DX_F – Weekly chart. If this volume continues to come in — this trend line will be a non-issue. But, consider the time frame. JNK – High yields may be at risk. Head and shoulders pattern on increased selling volume. May find support on the 200ema. CMG – Likely going to make its move this week. Could clear this pennant either way. I have a bullish bias on it because of the overall negativity. However, I’ll be watching for a play on either side. Volume is key. AAPL – Open gap to fill at $425.10. There is also some pretty serious volume support right here at 425. Depending on the price action & volume this week, the JUL 500 calls are starting to look pretty tempting. If Tim Cook is serious about returning 3b to investors over the next three years we may see signs of accumulation. BAX – Nice ascending triangle pattern. Been consolidating at recent highs for 3 months+. Looks to be under accumulation. BWA – Back on the list and I’m still in a starter position. Cup & Handle pattern is intact and I’m looking to add another 1/4 size clearing this descending channel. RNDY – Credit to @paulwoll. Nice clean chart and large channel with second higher low put in Friday possibly. Like it clearing 6.10. FOSL – Worked off overbought levels and maintained its price and this rising trend line. The island reversal two weeks ago was a bull trap so be cautious. This is going to need a lot of volume to get over resistance. Less than 100% won’t cut it. MA – Watching this consolidation pattern near the recent highs. Would like to see it move higher, clearing volume resistance, preferably on over 1.2m shares. VHC – I’m hesitant to put this one on the list because it’s being news driven with the lawsuits. They are going to be settling with AAPL with in roughly 40 days per the judge’s orders but thinking that may be the catalyst for this ascending triangle to play out. May take more time to play out. But, could easily test the highs. Don’t stick around if this pattern fails. PPG – Low risk/reward short opportunity. Stop is clearing volume resistance. First target is the gap fill. FB – Possible head & shoulders playing out. If it confirms, I am looking for a target of $24.00-$24.50. EMN – Descending triangle. Possible 8/50 MA bear cross this week. Increasing selling volume. JNK – See chart above. For what it’s worth, I adjusted the 20ema on my charts to the 21ema. I found it correlates better to the candles for the time being. We’ll see if it lasts. …In articles like this, have me alarmed. 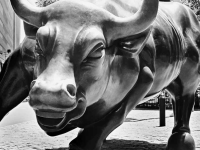 One likely scenario I see playing out–as retail investors who were sitting in cash on the sidelines begin to have their faith restored in the US stock market and start chasing this 1500 breakout, the markets will continue to push up a bit more before the correction begins. Exasperating the scenario even more, the financial twitter stream is top hunting & a continued slow and low volume walk higher will lure even more retail investor cash into the equation, making the rug pull even more fast & violent. I already got burned once this month trying to top hunt the fiscal cliff rally and rather than attempt to do so again I will continue just trading the tape but will be extra vigilant on scanning for signs of the beginning of the correction. Stay nimble & don’t argue with your stops or trading plans. I believe there is still some great money to be made on the long side but when the risk/reward doesn’t make sense, be in a cash position. BIDU – Testing the ascending trend line and digesting on lighter volume. Price has been maintaining long term $108.00 support. Watching for a follow through during the first part of this week. VHC – Ascending triangle pattern. Would like to see another 150-200% volume day to break it out over $35.50. V – Low volume consolidation (flag) after a nice run on heavier volume. Watch for the buyers to step back in and push the price back to the highs $162.50+. GGC – A merger between GGC & PPG have brought in the large volume into this name. I am watching this ascending triangle pattern for a possible push higher over the resistance. EW – Ascending trend line has been maintained. I would like to see 300%+ average daily volume to clear resistance and make a run for the gap fill. CSTR – This stock has been basing for 5 months. It is going to need a lot of volume to clear the recent highs. My buy trigger will be $54.25 if Friday’s volume stick is the beginning of accumulation. CVS – Looks like a rounded topping pattern and the selling is increasing. If it rolls over this week, a test of the previous base is a likely target ($50.00 to $50.25). FIRE – Still watching this name from last week. As long as I see no evidence of accumulation, I will start to scale into it a new short position at a test of the descending trend line. TIF – This one is on the short list because the volume to the downside has heavily outnumbered the volume to the upside, if it reverses and pushes higher over the descending trend line it could be a long position. Volume would have to be beyond significant. NEM – Selling volume starting to increase at this long term support level. Next major support area I see below is $37.55.